“César Meneghetti has created a complex work in two overlapping styles – art / document: a form of praxis based on the reciprocal incursion and confrontation of compensation within the creative flow of daily life” writes art historian and critic Simonetta Lux in her forward to the exhibition at the Museum Lab of Contemporary Art of Rome. “In his work the disposition of traces, material or immaterial, recodified in flux, converge with the human condition, the emotions, and the problems he encounters and experiences upon his way throughout the world – from Brazil to Italy from the Orient to Africa – and he manages to capture them in art, to discover innovative transnational interconnections and turn them into language, into work, into art: a singular manner of communicating and sharing, which art alone can reveal”. Composed initially for a series of 8 main oeuvres (video, photography, installation and documentation), K_lab – interacting on the reality interface narrates, documents, and analyses the work of the mostly female population in its fight against desertification and the struggle for water in the Keita Valley, the region situated between the Sahel and Central Africa. Until the 10th of January 2015 at the UNDER THE MANGO TREE GALLERY the video works K 03_the last slate (12 video series, 86”, HD, colour), K 05_still femmes (video, 15 min. HD colour), K 06_01011001 (triptych video, 4’, 10’ e 11’, HD, colour), part of the relational, processual, and multimedia project K_lab – interacting on the reality interface, built in Niger and Italy (2007/2009) and the new unreleased works (K 09_CMD+C_CMD+V, K_10_CMD+C_CMD+V and K_11) made specially for this occasion will be shown. On occasion of the opening there will be a talk entitled ART – INTERACTING ON THE REALITY INTERFACE on 06 November @ 18:30 with artist César Meneghetti, art historian and curator Tereza de Arruda, art historian, art critic and curator Simonetta Lux, and Philipp Wagnitz (WWF – Water Stewardship Officer) on Meneghetti’s experience as well as how art can change the interface of the real world. The Gallery’s director Mini Kapur will moderate. From 1983 to 2008 the international community (FAO, WFP) – and in particular the Italian Agency for Cooperation together with the Government of Niger – developed a programme for the Rural Development of Keita, which was aimed at relieving the affected area and aiding in its development. The Keita Valley in Niger was in full crisis, hit by desertification, deforestation, agricultural collapse, population increase, and male rural exodus. In 1984 a catastrophic drought devastated the entire area and its 100,000 inhabitants. But the rebirth of Keita is mostly due to the extraordinary activity of its inhabitants, most of whom are women, as portrayed in K 05_still femmes. In replanting almost 30 million new trees, the natural advance of the desert was halted, and they were able to rebuild the economic life of the entire area: a rocky lunar landscape plagued by difficulty of access and water shortage, as is seen the triptych K_06. The sounds and voice of the rap lyrics come from the unique female rapper of Western Africa, ZM (Zara Moussa), entitled “Ma Rage”, and have been re-arranged and re-mixed by DJ Matthew Mountford. During several missions from June to November of 2007 the artist César Meneghetti, the Italian photographer Enrico Blasi, and British video-maker Sam Cole documented the daily struggle of the local population. Meneghetti collected people’s testimonies, thoughts, emotions, and reflections on love, life and death: in short, their basic concepts of existence. This was the basis for the creation of “Keita Laboratory”, and then K_lab, a multidisciplinary artistic and interactive project that worked as an observatory, a container of ideas, of cultures and concepts. Furthermore, it served as a collision between a concept and reality in order to express the morphologic harshness of the landscape but also the hard work of the local population. Portraits, details, testimonies, and landscapes both represent and reveal the deep sense of “place”. The borders of reality and the technological interface, while the document, the narration, and the sociological converge, launching a multiple approach to a single object of observation. Reality and imagination ultimately establish an unusual relationship of complicity with the spectator. We are pleased to present the first solo exhibition of Berlin based Italian-Brazilian conceptual (video filmmaker/ photo- grapher) artist Cesar Meneghetti. Combining formal clarity with a strong compassion for his subjects, Cesar gives us a personal and straightforward view of the women he portrays. Cesar’s work is built upon a sense of trust and kinship, achieved through long-term relationships with rural- organiza- tions, communities, and families. Commissioned for the documentation, for K_lab, he traveled to Keita Valley in Niger between 2004 & 2007 – to “document the life” in the valley. Choosing his own representational knowledge which has a deep insight into the human existence, Cesar decided to take the portraits of the women who had planted 25 million trees over the last 20 years. The story is not just about the tree plantation and revival of the basic economy of the Keita Valley; his documentation is decisively about the women who made it possible, despite having been deserted by their men in the wake of the traditions made easy – by repeating one word thrice: divorce, divorce, divorce. This documentation is also about how science from the European culture supported the Valley dwellers, bringing them hope and to dream for betterment of lives and how the politicians abandoned the project and once again left them alone. Even today these women have to walk 9 Kms to fetch the water for their daily requirement. The images were composed individually– the subjects, are for him individuals who deserve the same respect that anyone in any other part of the world deserves. Producing striking photographs where the women pose alone, often looking straight into the camera. In a traditional patriarchal society where the freedom of girls and women is constantly restricted, and questioned, this process gave them a moment to reflect on their individual existence, on their individual wishes and experience a degree of independence and self respect. Meeting their intent, sometimes almost defiant eyes, we witness a moment of nascent self-determination. To survive. With only a few simple elements, Meneghetti does a lot. The women are posed in front of mud huts, almost all are perhaps, standing at the same point – all against the similar background – but an individual existence. Relating to each other and the viewer through eyes. The interplay between subjects and background creates a delicate balance, deli- berating the viewer to concentrate on the human. These photographs are accompanied by documentary, where Cesar clearly brings life to the their existence. In the gradual overlapping of the portraits, he masters the impact of a feeling of many individuals belonging to the source of one destiny. Here, the structure is narrative rather than conceptual, offering intimate glimpses into inner maps by erasing the line between photographer and the observer. Simple, alone and strong. In his works, the observer becomes the observed answerable to oneself. Per Cesar Meneghetti esistono quadri in movimento dentro cui prolifera la struttura stessa della vita. Con essa e dentro essa si muove il senso di identità, che altro non è se non un posizionarsi all’interno, stare dentro alla vita, crescerci dentro a forza di guardarla con occhi, attenzione, emotivamente mai vergini. Si, perchè nemmeno il soggetto è fermo. C’è un punto di partenza (chi si è) e c’è un punto guardato. E infine, come terminale, c’è un punto-composizione, un’azione artistica che ferma il movimento in pensiero. Ogni still è infatti natura ferma di qualcosa in movimento, dato che ogni movimento è proliferare, vivere. Perfino nelle interviste ogni persona che si ferma e indaga se stessa, le sue conoscenze o i suoi ricordi punta essa stessa il naso dentro a questo pensiero di movimento, lo odora, ci si inebria, si accorge di essere parte di un tessuto continuamente guardato. Questo tessuto modifica non solo la percezione, ma l’io stesso. Il quadro generale è composto da natura e uomini inglobati in spostamenti di toni cromatici e sonori. La visione si imprime, ci cattura, come suono ipnotico crescente, una lentezza che chiede di ricoprire la mente e lo schermo, per poi farsi punto fuori di esso, increspatura, bandiera, o riquadro che sia. Ci accompagnerà nel sovrapensiero una volta usciti dallo spazio espositivo. La scoperta di una terra, in definitiva, per Cesar Meneghetti, passa dalla scoperta della poesia. Questo ha a che vedere tanto con l’umano scorrere dei pensieri e dei ricordi, delle ancestrali abitudini, delle conoscenze e dei rituali, quanto con i colori e con l’animo che si perde dentro al mare delle sensazioni. L’arancione, la sabbia, l’acqua, il sole, il pensiero stesso, sono numerate vicissitudine che ipnotizzano e ci lasciano a naufragare con la mente nella distrazione dei pensieri. Immersi nel mondo che indaga i mondi di Meneghetti ci ritroviamo a fissare la mente su un suono e su un colore e a percepirlo come perfettamente identificato: Africa, ad esempio, pensiero chiamato Africa. I luoghi “catturati” dalla camera sono luoghi la cui anima vibra e si sposta, proprio come la mente in superficie nella meditazione o come l’oceano, laddove la quiete, la stabilità, la pace, il senso, sono completamente all’interno. La forza è all’interno, la vita è ovunque. special guests solange farkas (curator), marie ange bordas (artist), priscila arantes (paço director and curator). 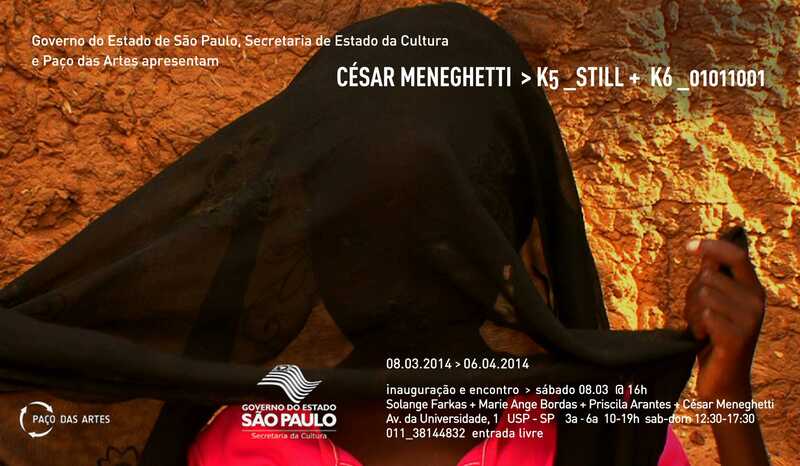 O Paço das Artes – instituição da Secretaria de Estado da Cultura – inaugura no dia 8 de março às 16h, a mostra “K_” projeto artístico de César Meneghetti. Na ocasião haverá uma mesa-redonda com participação de César Meneghetti, Solange Farkas, curadora e diretora da Associação Cultural Videobrasil, e Marie Ange Bordas, artista visual, escritora e educadora. A mediação será feita pela diretora técnica e curadora do Paço das Artes, Priscila Arantes. Serão apresentados no Paço duas obras complementares do projeto “K_”: K 05_still femmes (vídeo, 15 min. HD cor) e K 06_01011001 (tríptico vídeo, 2 min. cada, HD, cor). A primeira dedicada ao “homem” e a segunda à “terra” ambas extraídas do projeto relacional e multimídia intitulado K_lab – interacting on the reality interface, realizado na África (Níger-Itália 2007/2009) que narra, documenta e analisa o trabalho da população – na maior parte feminina – no combate a desertificação do Vale de Keita, região situada entre o Sahel e a África Central. “César Meneghetti compõe uma obra complexa em dois estilos sobrepostos, arte/documento: uma forma de práxis de arte baseada na incursão reciproca e na confrontação de identidade no fluxo criativo da vida cotidiana. No seu trabalho a disposição de traços materiais ou imateriais recodificados como fluxo convergem com a condição humana, os afetos, as problemáticas interceptadas e vividas ao longo do seu percurso pelo mundo, desde o Brasil até a Europa, ao Oriente, à África recriando interconexões transnacionais que ele transforma em linguagem, em obra, em arte. Uma forma rara de comunicar e compartilhar que só a arte permite vivenciar”, escreve a historiadora e crítica de arte Simonetta Lux no texto de abertura da mostra no MLAC Museu Laboratório de Arte Contemporânea de Roma. Entre junho e novembro de 2007, César Meneghetti, o fotógrafo italiano Enrico Blasi e o cinegrafista inglês Sam Cole, participaram de diversas missões ao vale do Keita dentro do projeto de PAFAGE (IBIMET – Conselho Nacional de Pesquisa Italiano), a fim de registrar o trabalho da população em luta constante contra a desertificação na zona limítrofe entre o Saara e a África central. Meneghetti e seus colaboradores participaram deste cotidiano, recolheram depoimentos, e puderam trocar pensamentos e sensações com uma população de camponeses sobre alguns conceitos básicos da existência. César Meneghetti realiza uma série de vídeos-documentos, como em K 05_still femmes onde o retrato de camponesas africanas na pausa de seu trabalho diário cria um duplo registro, objetivo/subjetivo, observando/observado, um retrato realista mas ao mesmo tempo não idealizado, até chegar à paisagem do lugar no tríptico do vídeo K_6 010010011 “de ritmo denso, com a cor de laranja e o vermelho se alternando nessa moldura luminosa e em movimento onde a paisagem parece naufragar na abstração digital. As obras são paradigmas, rastros que o artista encontra realmente, ao percorrer o território do Níger na ocasião do seu projeto, são reais e ao mesmo tempo produzidos pelo seu inconsciente cultural” como escreve Eleonora Carbone. Entre 1984 e 2007 a comunidade internacional a FAO, o WFP e a Cooperazione Italiana se mobilizaram para combater a carestia na Vale de Keita, lugar que havia passado em 1983 por uma grande seca, desertificação, empobrecimento agrícola e êxodo rural masculino. O renascimento do vale de Keita foi possível graças ao extraordinário esforço dos moradores da região, na grande maioria mulheres como as retratadas em K 05_still femmes que plantaram quase 20 milhões de árvores nos últimos 25 anos, e que conseguiram reconstruir a vida econômica da inteira região. O difícil acesso e escassez de agua, a paisagem árida quase lunar como a que vemos representada no tríptico “K_06”. Os sons e a voz do texto são da única rapper feminina da África Ocidental, ZM (Zara Moussa), intitulado “Ma Rage”, foi rearranjado e remixado pelo DJ Matthew Mountford a partir de sons e musicas gravados ao vivo por Meneghetti no Níger. 36A ART GALLERY – Bellaria Special Event of the Bellaria Film Festival > 2nd June to 30th June 2009. In mostra, all’interno del BELLARIA FILM FESTIVAL – Anteprima Doc, p.resso lo spazio 36A Gallery la versione ridotta della mostra K lab – interacting on the reality interface, un progetto artistico di César Meneghetti realizzato insieme al fotografo Enrico Blasi. Sam Cole ha curato uno dei video e Matthew Mountford ha curato il sound design. K_lab è progetto multidisciplinare che ha avuto inizio nel 2007 e si è sviluppato con l’intento di diventare un osservatorio di culture, suggestioni generate dall’incontro dei popoli, un contenitore di idee, di artisti, professionisti di diverse aree che hanno transitato nella valle di Keita. Negli anni ’70 la valle di Keita in Niger era in piena crisi. Desertificazione, deforestazione, crollo della produzione agricola, incremento demografico, esodo rurale avevano investito non solo la valle, ma tutto il Sahel. La disastrosa siccità del 1984 causò infine una catastrofe devastante per la vasta zona e i suoi 100.000 abitanti. A partire dal 1983, la Cooperazione Italiana aveva avviato, in accordo con il Governo della Repubblica del Niger, il Programma di Sviluppo Rurale di Keita, con l’obiettivo di recuperare la valle. Ma il miracolo della rinascita di Keita si deve soprattutto alla straordinaria mobilitazione degli abitanti. Nel 2007, durante diverse missioni a Keita svolte nell’ambito del progetto PAFAGE (realizzato dall’Istituto di Biometeorologia del CNR e dall’Accademia dei Georgofili su finanziamento della Cooperazione Italiana), César Meneghetti, Enrico Blasi e Sam Cole hanno raccolto la testimonianza del lavoro incessante degli abitanti di Keita, partecipando alla loro quotidianità, scambiando con loro pensieri, emozioni, riflessioni sull’amore, la vita, la morte, e hanno dato così vita al “laboratorio K”. Testimonianze video, installazioni, fotografie, rumori, suoni, voci raccolte a Keita intendono suggerire la lettura di un territorio che è sì la durezza morfologica dell’aspro paesaggio desertico, ma anche la forza e l’operosità di chi lo vive. Ritratti, dettagli, testimonianze, panorami svelano il senso profondo della rappresentazione dei luoghi. I confini di realtà e interfaccia tecnologica, il documento, la narrativa, il lavoro sociologico nato sul campo convergono, lanciando un approccio multiplo su un unico oggetto di osservazione, dove il vero e l’immaginazione instaurano uno straniante rapporto di complicità con lo spettatore. Il 2 giugno 2009 alle ore 19:00 allo Spazio 36A Gallery (in viale Pascoli a Bellaria) della 27. Edizione del Bellaria Film Festival si terrà l’inaugurazione di Videocabina #2, multi-channel projection, del filmaker ed artista César Meneghetti. Meneghetti ci farà conoscere gli abitanti di Keita (in Niger) attraverso 7 opere chiamate “K: K1 da 01-04“, (Videocabina #2) che propone interviste sui grandi temi della vita. Ogni singolo protagonista esprime il suo pensiero che viene registrato. Il risultato è uno scambio tra anime che interagiscono una davanti all’altra vivendo il presente con una connessione appunto interattiva.”K_Lab” è un progetto che César Meneghetti. ha realizzato in collaborazione con il fotografo Enrico Blasi, il video reporter Sam Cole ed il sound designer Matthew Mountford, che ha composto appositamente per le installazioni un mix di vari brani di musica tradizionale nigerina di alcuni gruppi etnici rielaborati/rimusicati elettronicamente. K_lab – interacting on the reality interface opens on Wednesday December 3rd at MLAC – Museum Laboratory of Contemporary Art, University of Rome “La Sapienza”. An art project by César Meneghetti made in collaboration with Enrico Blasi and Sam Cole. The sound design is by Matthew Mountford. The event is curated by Simonetta Lux and Domenico Scudero. During the 1970s the Keita Valley, in Niger was in full crisis, hit by desertification, deforestation, agriculture collapse, population increase and rural exodus. In 1984 a catastrophic drought devastated the whole area and its 100,000 inhabitants. At the beginning of 1983, the Italian Agency for Cooperation together with the Government of Niger, developed a programme for the Rural Development of Keita aimed to relieve the affected area and aid its development. Almost 30 million new trees were replanted and the natural advance of the desert was halted. But the rebirth of Keita is mostly due to the extraordinary activity of its inhabitants. From June to November of 2007, during several missions César Meneghetti, Enrico Blasi and Sam Cole documented the daily struggle of the local population. They collected people’s testimonies, thoughts, emotions and reflections on love, life and death. This was the basis for the creation of “ K laboratory”, an artistic multidisciplinary and interactive project. An observatory, a container of ideas, of cultures and concepts. The material collected was edited and developed in this first phase of the laboratory and the results are: video (le dernière clapper and stills/meneghetti), 8 channel videoinstallation (videocabina#2/meneghetti, 4scapes/cole), photographs (blasi/meneghetti), soundscapes (mountford). The aim is to express the morphologic harshness of the landscape but also the hard work of the local population. Portraits, details, testimonies, landscapes reveal the deep sense and the representation of “place”. The borders of reality and the technological interface, the document, the narration, the sociological converge, launching a multiple approach on a single object of observation. Reality and imagination ultimately establish an unusual relationship of complicity with the spectator. The MLAC will be this first gallery to present this work. This “work in progress” will be developed, transformed and is intended to travel to other cities like Florence, São Paulo, Paris, Havana, Berlin as well as Keita Valley in Niger. The project is a very deep documentation of a reforestation process that took place in Niger after a climate disaster. During the 70’s Keita Valley, in Niger was in full crisis, hit by desertification, deforestation, agriculture collapse, population increase and rural exodus. In 1984 a catastrophic drought devastated the whole area and its 100.000 inhabitants. At the beginning of 1983, the Italian Agency for Cooperation together with the Government of Niger, developed a programme for the Rural Development of Keita aimed to relieve the affected area and aid its development. Almost 30 million new trees were replanted and the natural advance of the desert was halted. But the rebirth of Keita is mostly due to the extraordinary activity of its inhabitants. The most interesting thing is that all the process was made in a completely sustainable way: no big dams to hold water, no big excavations to reforest, no foreign companies with impressive tools, but a series of micro interventions directly made by local population, with their knowledge and work, combined with the help of scientists. And it worked. The desert has been stopped and the valley is now alive again. The artistic project consists in a series of video-installation and big photographic portraits that want to give voice to Keita people and to their work. From June to November of 2007, during several missions César Meneghetti, Enrico Blasi and Sam Cole documented the daily struggle of the local population. They collected people’s testimonies, thoughts, emotions and reflections on love, life and death. This was the basis for the creation of “K laboratory”, an artistic multidisciplinary and interactive project. An observatory, a container of ideas, of cultures and concepts. The aim is to express the morphologic harshness of the landscape but also the hard work of the local population. Portraits, details, testimonies, landscapes reveal the deep sense and the representation of “place”. The borders of reality and the technological interface, the document, the narration, the sociological converge, launching a multiple approach on a single object of observation. Reality and imagination ultimately establish an unusual relationship of complicity with the spectator. The material collected was edited and developed consists in seven video installations by César Meneghetti and one by Sam Cole, photographs by Enrico Blasi and sound by Matthew Mountford.